Here are a couple of handy little tools that might get overlooked. More important, they call to mind a similar shop-made necessity. I got these NT Dresser mini rasps from Lee Valley, who call them “Japanese finger files,” as a last minute add-on to an order. No regrets though, because over the past year I have found them very helpful for finishing off details. Made of stainless steel and only .023″ thick including the grit, they can get into very narrow recesses. Yet they are stiff enough, when backed up as needed with a finger, to apply adequate cutting pressure and to preserve crisp details. Below, I am holding the half-round mini rasp, which is, of course, stiffer than the flat one. The “grit” is composed of tiny rough, tough knobs on the steel plate. Unlike conventional detail rasps, the NT Dressers cut in any direction so they can work in some places that those other tools cannot. I easily clear them of wood dust with the same stiff hog bristle brush that I use on regular rasps. The “medium” grit sold by Lee Valley is actually quite fine. The tool feels about like 220-grit sandpaper but leaves a surface more like 320-grit sandpaper. These are not aggressive tools; they are for details. NT Cutter (Japan) makes these in different shapes and grits, along with a line of larger tools. 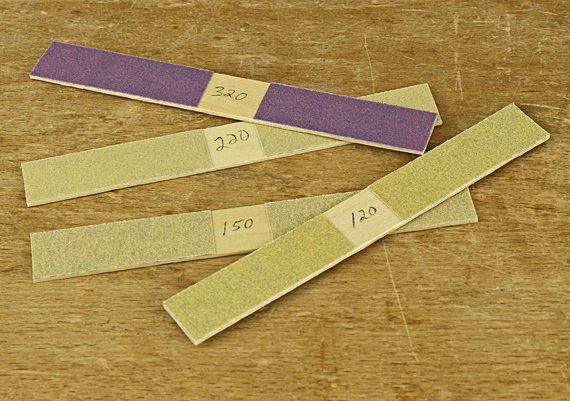 I’ve always kept a set of these little shop-made sanding sticks, pictured below, for use in countless detail and touch-up situations. They are probably not in any book’s list of important woodworking tools but I consider them shop necessities. They’re just PSA sandpaper (or glued-on regular sandpaper) on a squared-off tongue depressor or similar sliver of wood. The NT Dresser tools are more nimble though, which makes them a good complement to the old standbys. Made or bought, sometimes these humble little tools are just what you need. 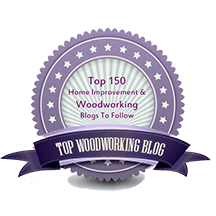 As much as we love wood, it can hit us with some awful surprises. Honeycomb, a drying defect, is among the worst. Here I will recount my sad tale of 8/4 quartersawn white oak, hoping you will be spared the same fate. First, let’s briefly review a simplified version of the drying process. The outer part of the board – the shell – loses it bound water and shrinks earlier than the inner part of the board – the core. The shell is in tension because it wants to get smaller but is limited by the still moist and swollen core, which is thus in compression. If this happens too fast, surface checks may result, which later may close and go unnoticed. The shell sets in size. Now, as the core loses its moisture, it wants to shrink but is limited by the surrounding shell. Thus, the core is now in tension and the shell in compression, a condition known as case-hardening. The kiln operator modifies the moisture content at the end of the drying process, and ideally, there would be no remaining stress. 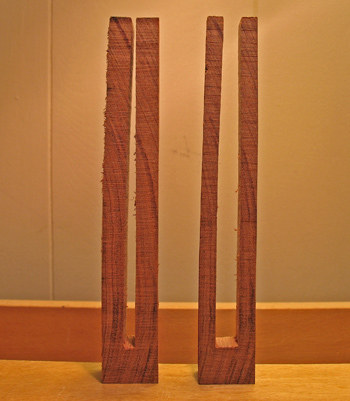 However, the irremediable state of reverse case-hardening must be avoided, so a bit of case-hardening is acceptable in the final state of most kiln-dried lumber, demonstrated by a slight inward curve of the tines of a test fork sawn from a cross-section sample of the board (below). Note that this is not a matter of a moisture gradient across the thickness of the board; it is physical stress. If you resaw lumber, you’ve certainly encountered this. Worst of all, this is not visible from anywhere on the outside of the board. The only clue you might get, which is inconsistent at best, is to note the board is oddly concave across its width on both sides. The cracks, revealed only when you crosscut the board, occur perpendicular to the annual rings in both flatsawn and quartersawn lumber. So, what happened in this white oak board? Probably several factors conspired. 8/4 is, of course, much slower to dry than 4/4, white oak is a relatively difficult species to dry well, and quartered lumber is a bit slower to dry. My guess is that this board was not sufficiently air dried before going to the kiln. 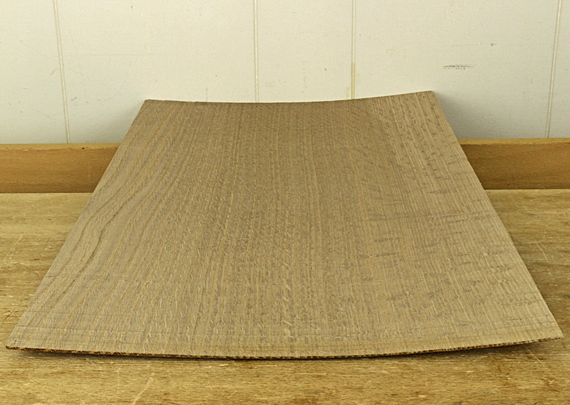 Further, since 8/4 white oak is less common, this board was probably lumped together in the kiln with thinner lumber and/or faster drying species for which a faster kiln schedule would work. In other words, it was rushed to market. What about using the parts of the board without honeycomb? Nope, best not. Even sections distant from the frank honeycomb were severely case hardened, as demonstrated by these test forks (above). Whether a lot or a little of the interior core was removed, the tines are bent over each other. 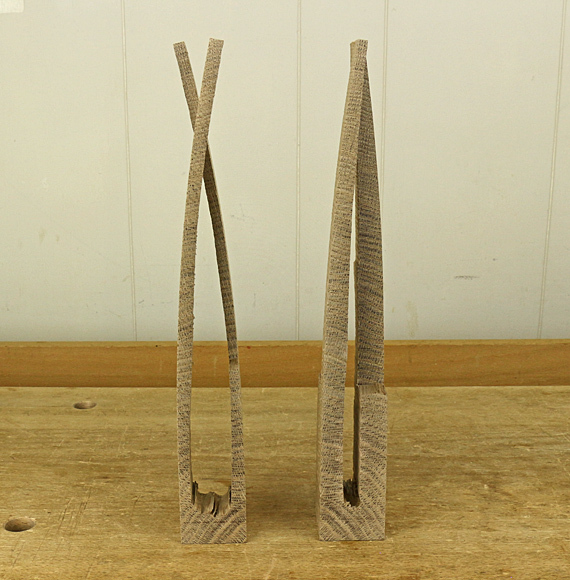 It was amazing how forcefully they bent inward against each other before I halved their widths so they could cross over each other. Again, to be clear, there was no moisture content gradient across the thickness of the lumber. Severe stress like this wreaks havoc in the building process. I tried to salvage the expensive board but as I would incrementally remove thickness, attempt to resaw, or shape the wood, it persistently distorted. I was constantly and futilely chasing true surfaces. Enough. 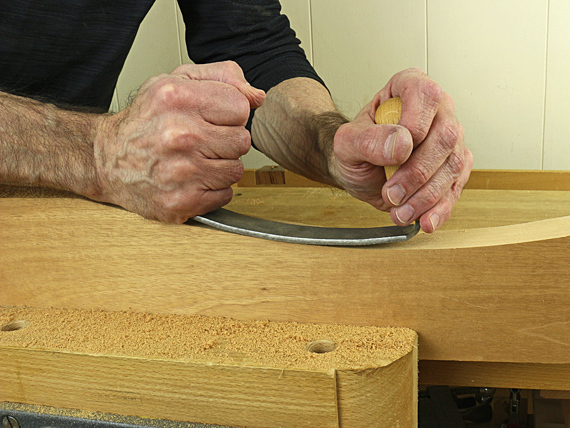 Sharpening is so much at the core of hand tool woodworking, and so here are a few thoughts that build on the previous post on sharpening tests. 1. Can we close the loop and say that the proxy tests are actually validated by the tool’s performance? Based on experience, yes, regarding sharpness, edges perform as the tests predict. The tests are worthwhile. 2. Edge endurance, however, is another matter. There you are relying on the “design” of the edge and the reliability of your sharpening process. The only “test” is over time – seeing how long the edge lasts. For good results, you must match the edge geometry to the steel and the task. For example, A-2 is a good choice of steel for a jack plane blade but if the bevel angle is too narrow, such as would be good for O-1 steel, the edge will be prone to premature chip-out. 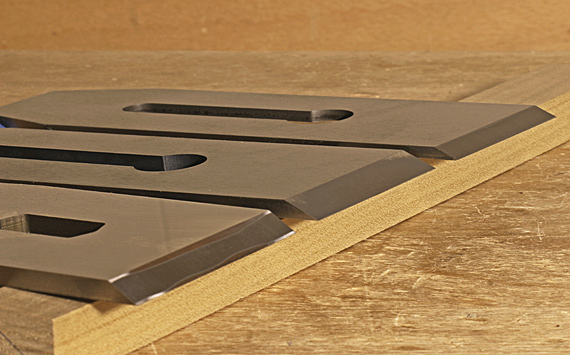 As another example, a plane blade with a wide bevel angle (e.g. 43°), though correctly employed in a bevel-up plane to create a high attack angle to reduce tearout, will necessarily have a shorter useful working life than narrower edges. 3. Squareness or, as appropriate, the correct skew angle, is, of course, easy to test. 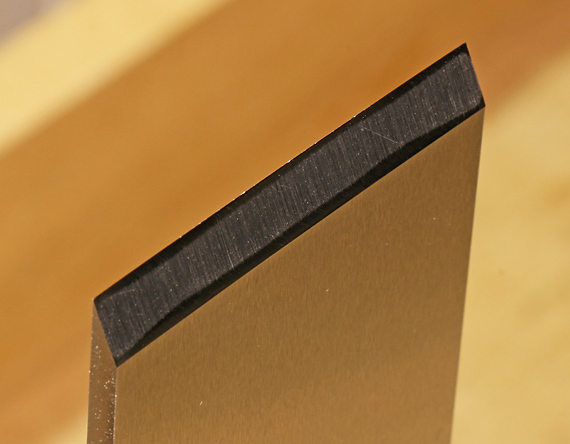 By the way, I find that a chisel edge that is just a bit out of square is not a big deal, as is sometimes supposed. There’s also a bit of squareness tolerance in most plane blades. 4. 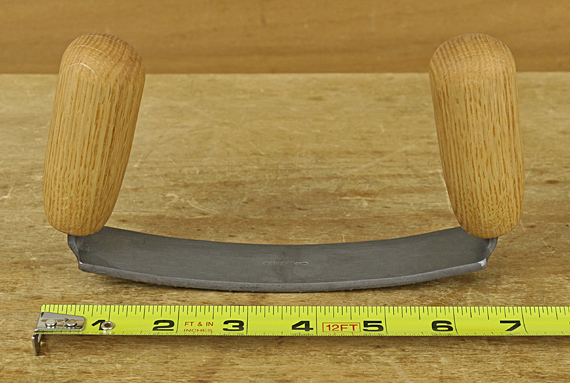 For many woodworkers, the most vexing matter of edge geometry is plane blade camber. For choosing, producing, and assessing camber, I invite readers to visit this series of five posts, which is about as in-depth a treatment of the subject as I think you will find anywhere. The only fully meaningful tests of a sharpened edge are its performance and endurance in its assigned task. Nonetheless, at the sharpening station it is convenient to use surrogate tests to evaluate the fresh edge. Even with high confidence in your sharpening procedure, it is helpful to ensure the edge meets your expectations before you put it to work. This is especially so for plane blades. I do two evaluations. Most important, I look at the edge. The irony is that being able to see it means it probably is not good enough. Look almost straight on at the edge under a bright light, preferably with magnification, and try to catch a reflection off the edge. I use the large, low-power lens in the articulating art lamp at my bench. Play the blade under the light, searching for a reflection. If it is really sharp, there is none to see. This is difficult to photograph, but the O-1 edge shown above is about as pristine as it gets. 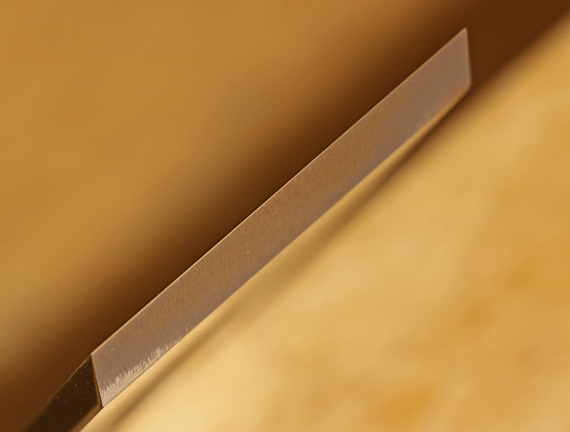 The narrow secondary bevel and a few dust particles are visible but the edge is clean and invisible. Examine all along the edge. It may be fine except for a defective blip that reveals itself by reflecting light. That may be acceptable for a mortise chisel but an unwelcome frustration for a smoothing plane blade going to work on pearwood. 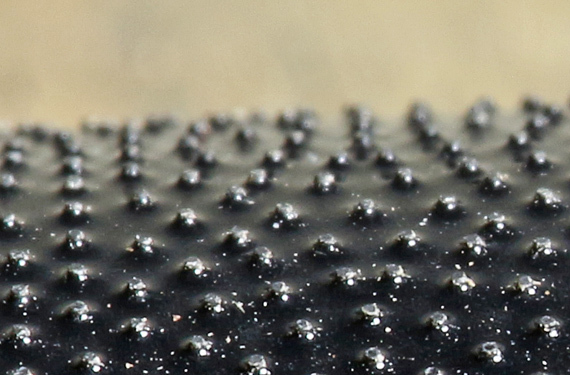 Below is a used edge with several obvious blips, even though the rest of the edge is pretty sharp. Because the endpoint of this evaluation is a negative observation, and there are probably differing levels of sharpness within that, I like to also have some positive demonstration of the edge’s capability. My preferred functional test is to shave hair on my arm. I gently bring the edge up to just a few hairs. For a smoothing plane blade, for example, I want to see those hairs well-nigh pop off with minimal pressure. I find the amount of pressure needed to cut hairs is a good indicator of sharpness. Using hairs growing at different angles or of different stiffness can be even further revealing. With just a little experience, it becomes easy to reliably differentiate high levels of sharpness. After all, we intuitively use this sense all the time when shaving with a manual razor. If the edge performs well on the hair test and the sight test does not show defects, I’m happy with it. For easy sharpening jobs such as chisels, sure, it’s often adequate to just trust that my usual sharpening sequence produced a good edge. For almost all plane blades, however, I do test the edge visually and functionally before putting it to work. All of this assumes, by the way, that geometry of the edge is satisfactory – squareness, camber, and angles, as appropriate. Some woodworkers are comfortable with other tests. A good one is to pare the end grain of a soft wood. 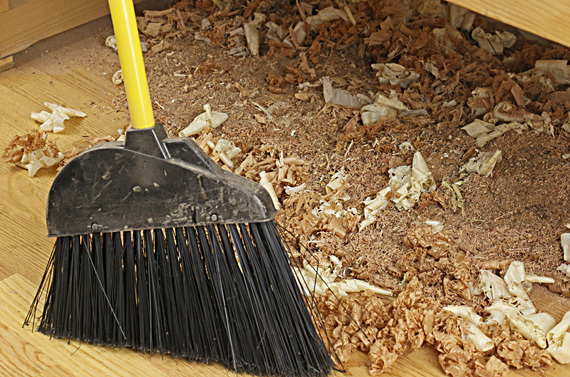 Little pressure should be needed to make a very thin, clean slice without collapsing the wood’s vessels. Practice will soon reveal how a very sharp edge acts in this test. Another method is to see how low an angle you can engage the edge as you slide it along your fingernail. I don’t like aiming a sharp tool toward my cuticle. The barrel of a plastic disposable pen is a better, safer test surface. One method that I do not think is useful is to feel the edge by brushing your finger across (not along!) it. Yes, you can tell a really dull edge from a decent one but I do not find this is a good way to differentiate high levels of sharpness needed for woodworking. Now, as I work on a new design, there are matters of wood, style, proportion, and details. There are plenty of technical problems to solve. My mind swirls at times with all the issues and all the possibilities. I find myself asking if this piece is really worth it. Worth what? Is any piece worth it? Is the essential idea, the concept, growing? Is it bringing forth the energy that the project will require? All of this is part of the joy of creating. I love it, but it can get out of hand in many ways. Tension comes about, some of which is good in that it generates energy. But some can be damaging, and that will ultimately reflect in my mentality when building the piece and in the finished product. And there is Krenov, again, with the advice I need. 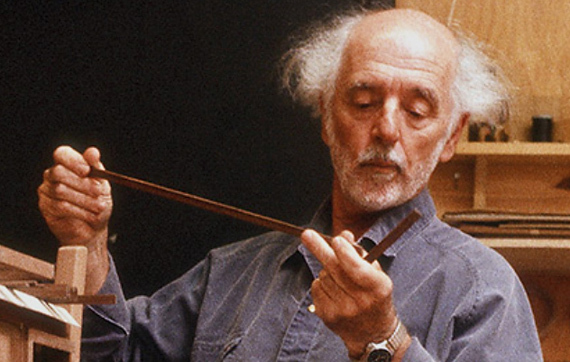 In his book With Wakened Hands, he counsels, “Worry less, concentrate more, and above all relax.” Krenov’s work elicits in me an energetic but peaceful response – the “quiet joy” – and so does his advice. I don’t know why it took me so long to get one of these. It’s one of those “Ahhh” tools – a favorite as soon as you handle and use it. The Hamilton gauge (this is the 4″ model) fits wonderfully in the hand. The grip affords excellent control to keep the fence tight to edge of the work piece, to regulate the depth of cut, and to start and stop the cut. A key feature of this gauge is the fingernail-shaped blade. As you would expect, it cuts cleanly across the grain, but it is also fully effective along the grain where it does not tend to deviate by following the grain of the wood. The blade is at the end of the stem so you can easily see what you’re doing, an arrangement that I much prefer. 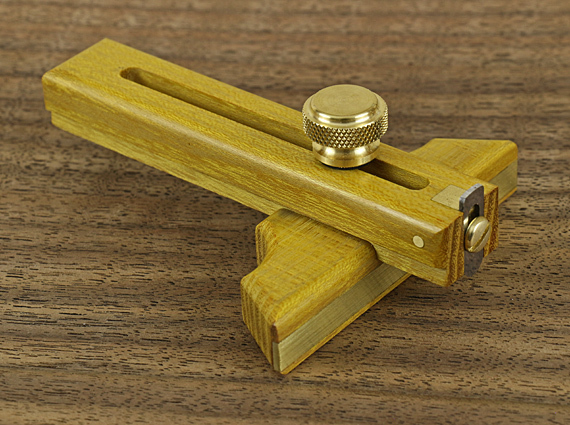 It is secured by a machine screw that threads into a tapped brass block, and can be installed with the bevel facing in or out, so you can always keep the bevel in the waste wood when marking. 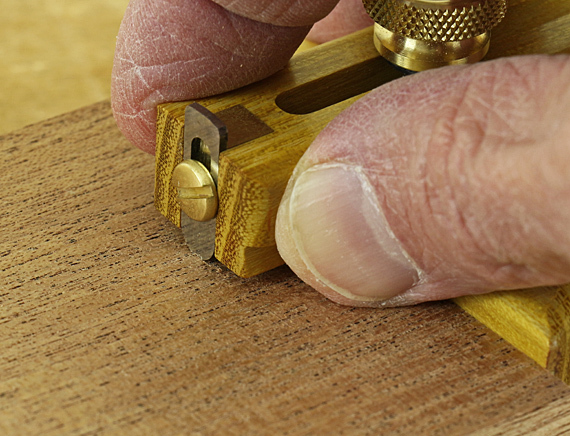 The stem of the gauge travels in a snug dovetail slot, which allows for one-handed adjustments. A nicely knurled brass knob easily secures the setting. The fit and finish of the Hamilton gauge are magnificent. This is one of those great-looking, great-working tools that is inspiring to have in the shop. Jeff Hamilton also makes this type of gauge in a 6″ model, plus larger traditionally styled gauges, and a panel gauge, all in a variety of woods. I like mine in osage orange. I wrote a series of posts about gauges a couple of years ago. I’ve somewhat revised my gauge set since then. The Hamilton gauge, which I prefer to the Titemark, is now among my favorites along with the Marples mortise gauge and the Japanese cutting gauge. This review is unsolicited and uncompensated. I love goods tools and, equally, detest poor ones, and I want readers to know of the former and avoid the latter. This rasp is unique: the toothed surface is flat across its width with a convex curve along its length, and handled at both ends. 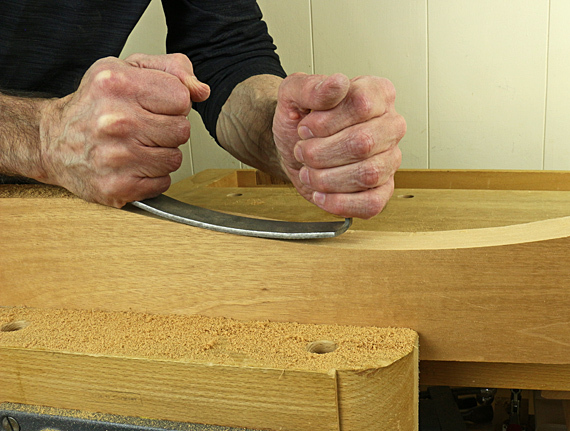 Grasp the handles intuitively – from the sides or over the top – and bring teeth near the leading end into contact with the wood (top photo), then ease the trailing part of the rasp onto the wood (photos below), using a pull or push stroke. Let the sharp teeth do the work; don’t force them into the wood. As you move along the desired curve, you’ll subtly feel more resistance over bumps, less over hollows. This does not work like a compass plane or spokeshave because they have only one contact point that cuts. The rasp cuts all along its length, encouraging a sweeping motion. Curves are generally best worked in the downhill direction so as to work with the grain, but this can vary. 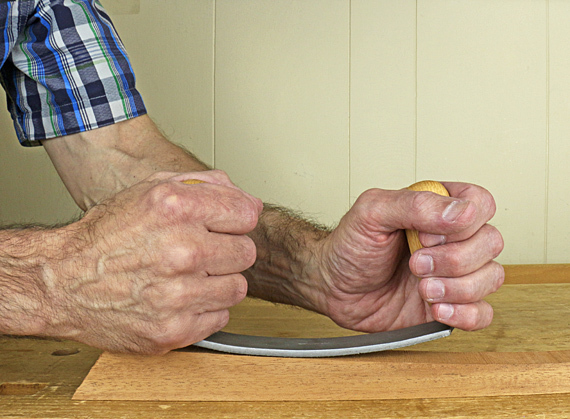 I readily switch from a pull stroke to a push stroke as I work, gently tipping the rasp toward or away from me as needed. This tool encourages working instinctively. The constant radius of curvature of the rasp makes all of this easy and intuitive. 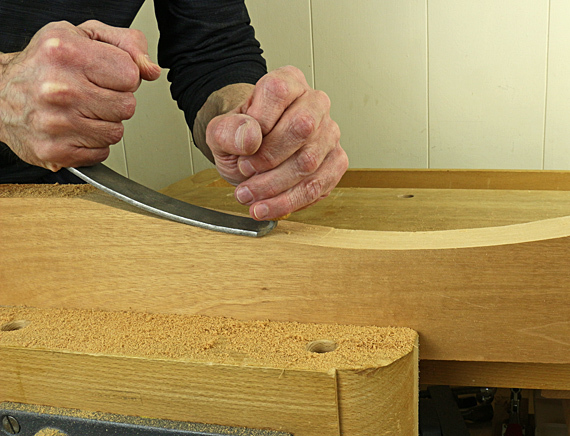 You can use any part of the rasp, changing from push to pull, and always know the curve you are presenting to the wood is constant. (Of course, this does not mean the rasp is restricted to working on curves of constant radius.) In my early designs for this tool, I found I could not work as fluidly with a variable radius. The stiffness of the rasp, the tang fit of the handles, and the smooth-cutting sharp teeth, magnificently crafted by Noël Liogier and his team, work together to provide excellent feedback to your hands as the curve takes shape under the tool. You can feel the curve becoming true even before you stop to look at it. I think you will be delighted with the performance of this rasp. Liogier sells it for €58, about $66, which is a bargain considering its durability, utility, and the incredible workmanship they put into it. 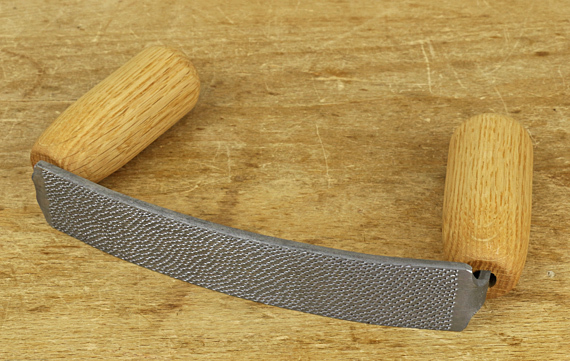 This unique rasp, handmade by Liogier in France, will allow you to deftly produce beautiful curves in your woodwork. The stitched surface is flat across its 30mm (1 3/16″) width with a shallow convex curve (radius = 320mm) along its 160mm (6 1/4″) length. The robust hardwood handles at each end can be gripped from the sides or over the tops to give you power and control with an in-line push or pull stroke. You will feel exquisite tactile feedback as you fair gradual curves such as refining bandsawn curves in a table leg or rail prior to final smoothing with a scraper or sandpaper. I suggest grain #10 or 11 for general furniture work. After years of wishing such a tool existed, I designed this rasp in my shop using wooden and sandpaper mockups, and extrapolating from other rasps. I experimented with various curves, lengths, and widths for the cutting surface, and also put a lot of time into trying different positions and shapes for the handles. I presented the design to Noël Liogier who produced it with his legendary skill. The result: c’est manifique! It is now available from the Liogier website for €58, currently $66.57. You may find it helpful to visit the post I wrote a few years ago about available options in tools for working curves by hand, and the two posts about the process of fairing curves. There are two key points. First, distinguish between two different processes: shaping the curve and smoothing the surface. Second, when fairing (shaping) the curve, you need a tool that provides continuous tactile feedback of the developing curve. The tool must have sufficient rigidity and length to reduce aberrant bumps and troughs. 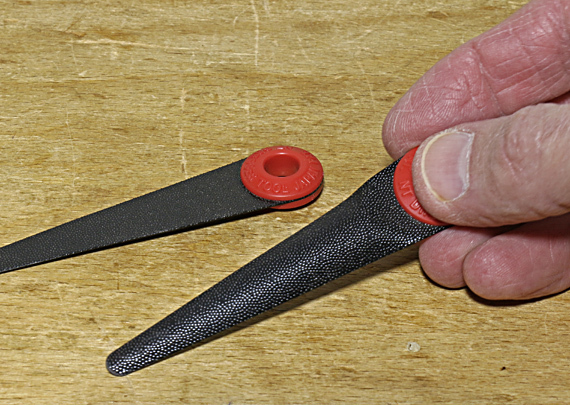 This new rasp is far better for fairing curves than other options such as an adjustable float, Surform shaver, or diagonally pushing the convex side of a half-round rasp. 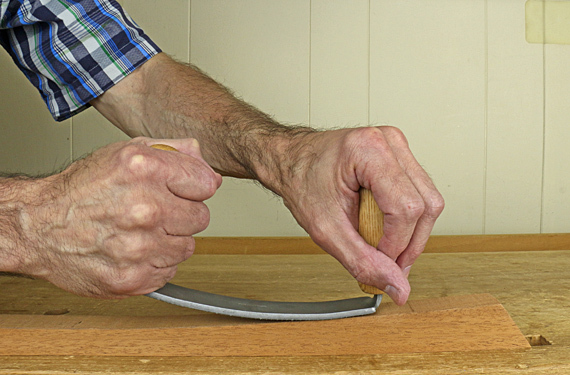 It also provides better control and power than do curved ironing rasps for this task. 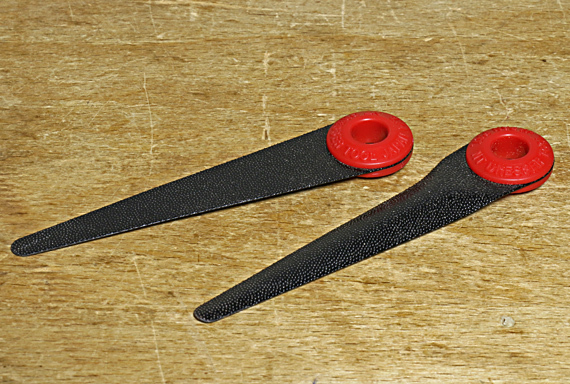 Shorter tools such as a spokeshave or scraper are less reliable for fairing. I also think you will find this rasp more user friendly than a compass plane or other curved-sole planes. Liogier is one of the two best-in-the-world makers of hand-stitched rasps, both in France; the other is Auriou. 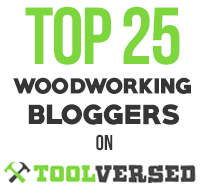 This video shows some of the incredible workmanship that goes into these tools. There is nothing quite like using a hand-stitched rasp. This new design adds to the venerable repertoire. If you do give this new rasp a try, I’d love to hear what you think of it. You’ve cut your joints, fitted them individually, and happily found them to be tight and true. Now you dry assemble the frame or carcass, which should include applying the clamps to rehearse the conditions under which the glue will dry. Unfortunately, you may well find that despite the rightness of the individual pieces and joints, and having applied the clamp forces in true directions, the assembly is out of square, twisted, or harbors some other seemingly unmerited vileness with which you must now contend. What’s going on? Well, I suppose tiny tolerances, wood movement, unnoticed error stacking (and probably the alignment of the planets) have somehow militated against the righteousness of your assembly. As careful as I try to be, I find at least a little bit of this is not the exception but the norm. So, the next step is to tweak the clamp placements to true the assembly. For example, you can use pinch rods and recall the rule of the long diagonal. But how much should you force the assembly into true? Consider that you are probably using several clamps, each capable of perhaps a thousand pounds of force, which can easily bend and twist wood. You may be truing one aspect of the assembly while distorting another, making it impossible, for example, to later get a good sliding fit with a drawer. 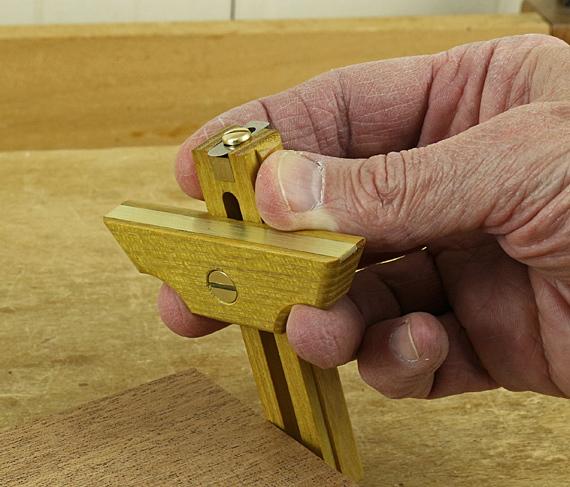 Clamp force can also compress wood, especially on side grain where it meets end grain, which is part of most joints. I think a little bit of this nearly always happens in clamped glue ups and acts as an acceptable correction mechanism. Carried too far, however, I suspect it may show up next year as gaps at the joints because the glue line has some elasticity, especially with PVA glue, and the wood compression may not be fully elastic. The point is to not add too much stress to the final assembly by using clamp force as a correction mechanism. As much as possible, the components of the assembly should “want” to go together true, flat, and square. Very small corrections by clamp placement to true the assembly during glue up will likely not cause problems, but overwhelming a fundamentally untrue assembly with clamp force is not a good approach. Neither is making joints so loose that they can be easily forced into any configuration. If the assembly requires anything more than gentle correction with clamps, go back and tweak the joints and/or components if possible. 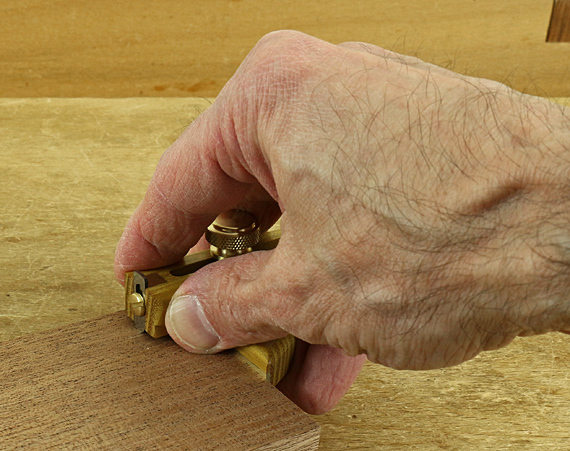 As examples, judiciously trimming tenon shoulders will solve many frame constructions. Dovetail assemblies can sometimes be tweaked by planing the inside face of the tail board, or easing overly tight spots in the joint itself. 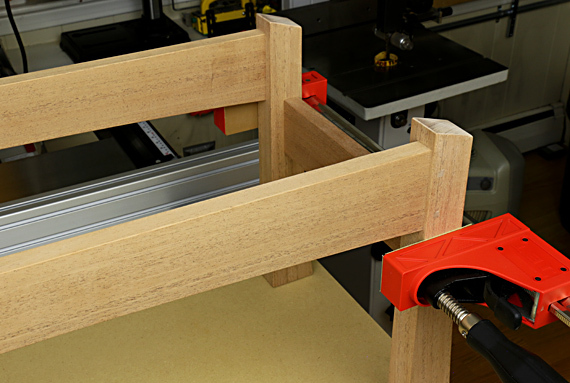 Finally, keep in mind that you can also compensate for some imperfections in the glued-up assembly. For example, a slightly twisted frame-and-panel for the back of a cabinet can usually be easily held flat by the cabinet itself without significantly stressing the carcass. On the other hand, a slightly twisted cabinet door or box lid is difficult to fully correct directly, so it is usually easier to plane the front edge of the carcass (preferably before glue up!) to accommodate the twist in the door. Every situation is different, but the general principle is: don’t force it much! Try to use good stock preparation and joinery, make judicious corrections as needed, and think through how remaining imperfections might be accommodated. And maybe you’ll find the planets to be aligned in your favor after all.